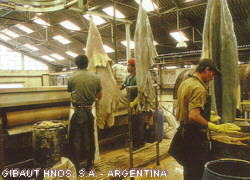 Being the most important factor in the process, the hides coming from slaughter houses, go through quality control, cutting and classification. 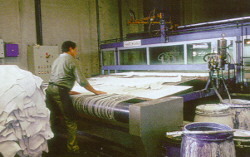 This chemical/mechaninc process takes place in drums or pools. It takes the hair off, and opens the fibers to let it absorb the products to be used later on. After coming out from the drums, the fleshing machine take away any flesh or fat that could still remain on the flesh side of the hides. 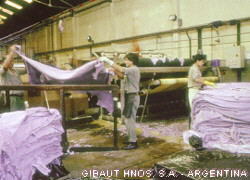 Is the main process, as it turns a perishable hide into a non-perishable and stable in time leather. The chrome absorbed by the fibers, makes it possible. 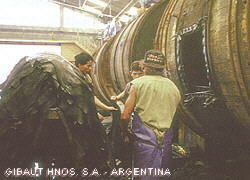 The total time for this process is 24 Hs. divided in three stages: Liming, deliming and pickling. Pushing the leather through cilinders and absorbing bands at high pressures, let us reduce the leather humidity to about 60%, and also extends and prepare the hide for the next steps in the process. 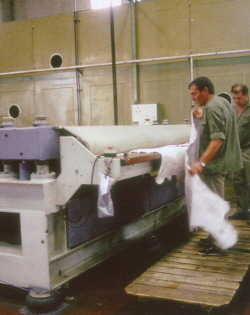 This machine turns the leather to the aproximate desired thickness, and generates a by-product, the Splits, wich can be sold as Wet-blue splits of being processed further and sell as finished or semi splits. 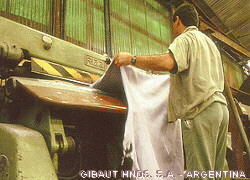 At 2.700 rpm the high-precission blades in this machine, get the hide thickness to an even messure all along the surface. With the use of high-quality aniline, dyes, and specific base-products, the hides get the desired color, and recover the natural grease lost in previous stages, reaching the required touch and softness. 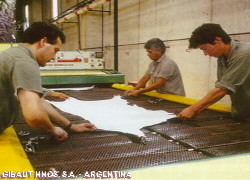 Using state-of-the-art techniques and exposing the hides to steel plates at 50-65'C and in vacum conditions, let the water evaporate faster and in a controled way. 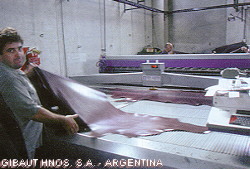 This complements the drying process, in this case in drying tunnels, and giving the leather grater and smooth surface. In this stage the leather gets the desired touch and softness. After this process the leather is in semi-finished state. 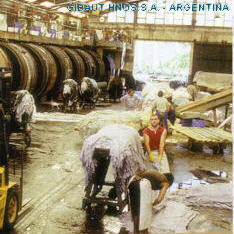 Some are sold this way and the most continue to the finishing process. 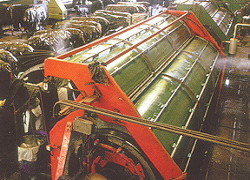 The sprying line -depending on the product being processed- can be as long as 100m with several sprying stations and drying tunnels. Different paint and resins give the leather the right brightness, look and resistence. 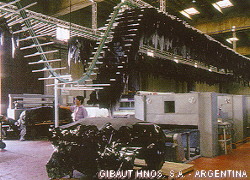 One of the options available when producing finished leather. Different products means different process, so one important thing is to have a broad range of machines to perform the processes needed. As part of the finishing stage of the process, the press with different operating temperatures and pressure, let us achieve the desired smoothness or in the case of imprinted leather, de desired pattern and effect. 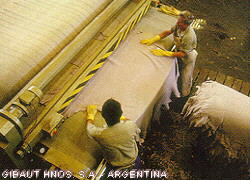 A the end of the production process, all hides are quality checked, and classified. 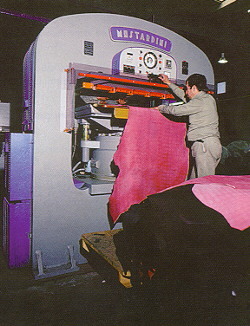 Then, with accurate machines, the hides are measured. All the data enters the production system, to output the packing list, and giving us the needed feedback about the whole process. 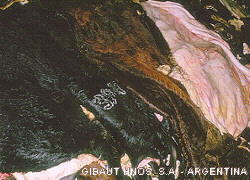 Just before delivery to the shipping stations (Buenos Aires Port or Ezeiza Airport), the hides are packed according to the needs of our customers. Each pack contains a label afixed with all the information about the hides contained, and a barcode for a fast delivery control.